The Blastrac BGS-250A is a single-disc concrete grinder especially designed for small to medium horizontal surface preparation applications. 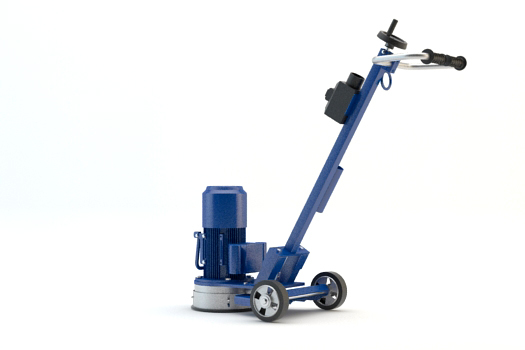 The BGS-250A is a single-disc concrete grinder equipped with a special system of vacuum measurement. The machine will automatically stop when the vacuum is too low. The BGS-250A is operational friendly and comfortable to use with low vibrations. The single grinding head allows all the pressure of the machine to be distributed onto the one diamond disc in use. This makes the machine perfect for "aggressive" grinding. The Blastrac BG-180EC grinder is specifically designed for edge and corner grinding applications. The BGS-250 MKII is a single-disc concrete grinder especially designed for small to medium horizontal surface preparation applications. Find all the functionality and versatility you need for grinding different surfaces with the Blastrac BG-250P petrol grinding machine. The Blastrac BG-250A is a single-disc concrete grinder designed for heavy duty surface preparation applications. The Blastrac BB-700E is a burnisher designed for polished concrete installations & maintenance.